Part of the responsibility of being a law abiding gun owner is ensuring that your firearms do not fall into the hands of “unauthorized persons”. While the term, unauthorized persons, may mean something different to different people. If you have family and friends visiting your house, storing your firearms (not in use) in a secure location is important. For me, I choose to keep any firearms not in use locked up. The term not in use is also another term that means something different to each person. While it is fairly easy to understand that your hunting rifle is not in use unless you are hunting or practicing, the line of when a firearm is or is not in use becomes blurred when we are discussing defensive firearms. For me, if the firearm is not on my hip or “on the night stand” while I sleep, it is not in use, and therefore is unloaded and locked away in a safe. As a father, I have found it incredibly important to ensure my kids understand the rules of safe gun handling. This is something I have drilled into their heads since they were able to listen. However it only takes once for an accident to happen, which can not be undone. Also, I have other children visiting my house such as nieces, cousins and friends of my children. For this reason I wanted a secondary quick access type safe I could have in a secure, but slightly more convenient, location than my large storage safe. 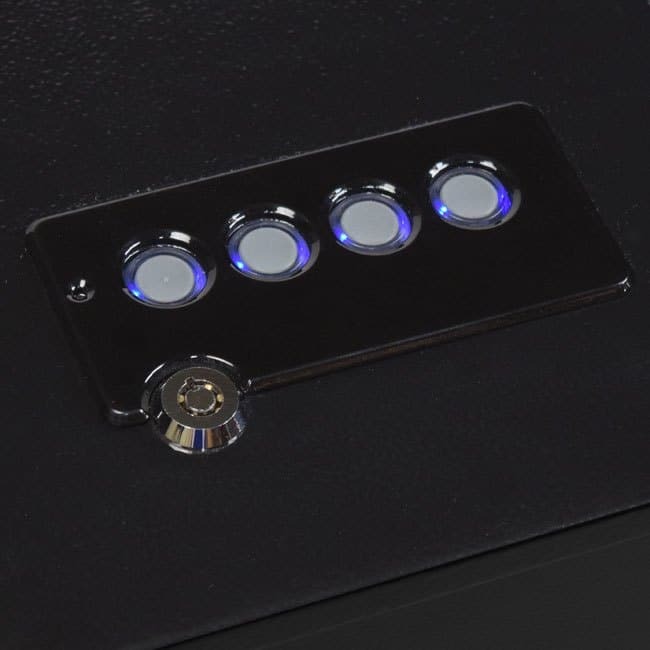 Key Pad Combination Access – In the middle of the night, if the front door is kicked open, I would not have time to fumble with a key or find a fob, or turn a dial combination. Keyed Access – Although I likely wouldn’t have the time or manual dexterity to operate a key in the middle of the night, having the redundancy of a key incase I forget the combination is important to me. I did once forget the combination to one of my safes. Oops! Small size – I didn’t want something too large. It’s not my intention to store more than 1 or 2 firearms in this location. Interior light when the door opens. – This isn’t even something I knew I wanted. Steel construction. – Plastic would have been fine but steel, why not? Mounting screw holes manufactured into the steel frame. The Stealth Tac Handgun Hanger Safe STL-HH-SAFE is about 15 lbs. It’s 9″x9″x12″, so not something I would keep in a dresser door but could fit perfectly in a closet or under the bed. The face opens from the front face, which is adequate. I also thought it would open from the top if I stood the safe on end, more on that later. It also comes with a locking cable if you didn’t have the capability of screwing the safe to a wall or a floor. Inside the safe is an internal shelf and a rack for storage of 3 pistols. I actually did plan to install the safe on en, so it would open from the top rather than from the front. However the internal spring which pops the door open isn’t strong enough to open the door vertically. There is no handle on the door, so if for some reason the door is blocked or doesn’t pop open properly, you have no way of opening the door, except maybe a key or knife or re-entering the combination. However that all takes precious time you might not have in a life or death situation. I seriously am considering the installing a handle to the door. The combination is 6 characters. While 6 characters is more secure than 3 or 4, it also means greater chance for failure when you are awoken from a deep sleep in the middle of the night. Although you can change the combination, it must still be 6 characters. This in my opinion is a major draw back for my desired “quick access”. All in all I think the Stealth Tac Handgun Hanger Safe STL-HH-SAFE is a well construction and well designed safe. Perhaps after months or years of ownership I would come to find more things I like or dislike about this safe. The only real negatives are the 6 key combination and door without handle. On a scale of 1-5 with 5 being purchase and 1 being don’t purchase, I might consider this safe to be a 4 on the scale for “quick access” safes.